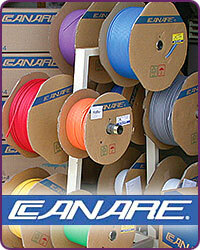 Canare Audio and Video Cable, Connectors, Reels, & Patchbays at HAVE, Inc. - HAVE HAS IT! Canare is one of the premier manufacturers of professional audio and video connector and cable products in the world! We have a huge selection of Canare cable and Canare connector products for you to choose from. After all HAVE is the largest long-time stocking distributor of Canare Cables and related products in the United States. In fact, we have over 700 Canare products online in our store, more than anyone else online! If there is a Canare product you need that you don't see here in our store, just send us an e-mail or call us at (888) 999-4283 and we'll get it for you!